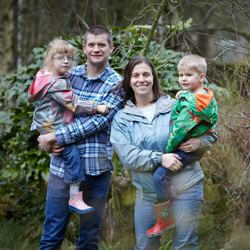 Martin and Tina Bown are parents to Isabella and Josh and are two of Cerebra’s keenest supporters. Isabella was diagnosed with cerebral palsy when she was a baby. She was born ten weeks early weighing less than three pounds. Although Martin and Tina were told she would not be allowed home for seven weeks, she made it home in five. Doctors are unsure just how the cerebral palsy will affect Isabella in the future but she is making great progress. She has weekly physiotherapy and attends Paces School for conductive education alongide her local primary school. Watch a video about Isabella’s amazing sponsored walk. Cerebra have helped the family with advice and support and made it possible for Isabella to go to Paces. To show their support the Bowns have raised more than £4,500 for the charity to date through a variety of fundraising events.